Reproduced here is the original typewritten foolscap sheet used in a radio studio for a broadcast nearly 60 years ago. Titled Rhaglen Gymraeg (Welsh Programme), it was transmitted by the Dublin and Cork Broadcasting Station from their Dublin studio. The hour and a half of Welsh music went out on the 1st of June, 1928, with four soloists and the Station Orchestra. For two small boys, on our isolated small holding in the parish of Treuddyn, near Mold, the prospect of hearing the wireless for the first time caused great excitement. It would mean an uphill one-and-a-half mile walk to the only house in the village with a wireless. set. And staying up late to hear this 8-9.30 evening programme. The programme's director was W. S. Gwynn Williams. He also arranged some of the folk songs in the selection, and the orchestral pieces were of his composition. This doyen of Welsh music, of Plas Hafod, Llangollen, was born in 1896 and was, at the time of the, broadcast, editor of "Y Cerddor Newydd'" ("The Welsh Musical") Magazine. The Editor's Notes of the March 1928 number refer to the monthly programmes of Welsh music emanating from Dublin and Cork in the then Irish Free State. W. S. Gwynn Williams was a conductor, lecture-recitalist, organiser of the Gorsedd Music Board, adjudicator, and later, organiser and director of the Llangollen International Eisteddfod. Emrys Cleaver, in his 'Musicians of Wales' (John Jones, Cardiff Ltd., 1968), devotes a chapter to him, saying "Everyone knows this man ... ". At the time of this Dublin broadcast he had just edited the Welsh Community Song Book (price four pence) used at the Community Singing Festival broadcast from Rhosllannerchrugog on the 27th of June, 1927, and repeated on St. David's Day, 1928. It was a selection of hymn-tunes and Welsh airs, including such favourites as 'Tros y Garreg' and 'Y Gwcw Fach'. Both are in the Dublin broadcast. 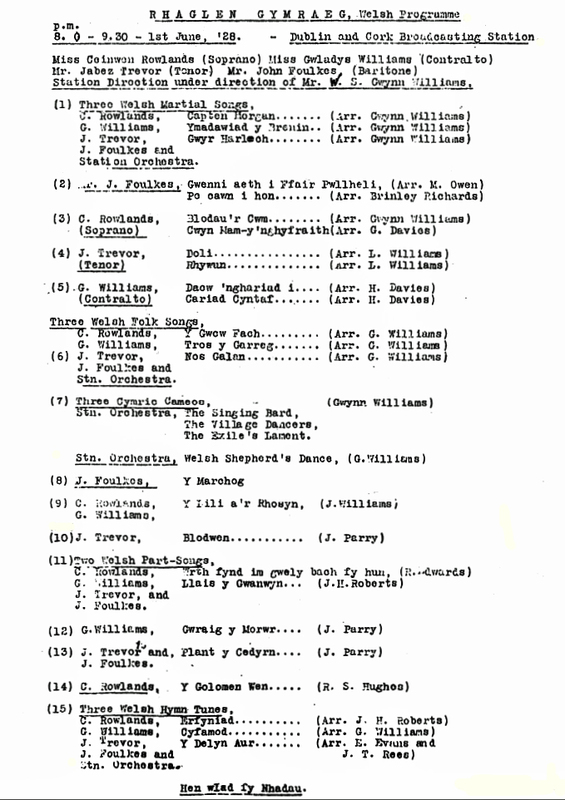 W. S. Gwynn Williams published his book, 'Welsh National Music and Dance', in 1932. Among his many songs are the well-known 'Can y Gwladgarwr' ('The Patriot's Song'), 'Breuddwyd Glyndŵr' ('Glyndŵr's Dream') and 'Yr Ehedydd' ('The Lark'). His many honours include the award of the O.B.E. But he began composing at a very early age. Perhaps his best known is the sentimental 'My Little Welsh Home', recorded, among others, by David Lloyd (tenor) on Qualiton Cassette KSQUC 114 ('The Silver Voice from the Land of Song') and by Stuart Burrows (tenor) on Decca Cassette KDPC 607 ('Songs for You'). 'Gwenni aeth i Ffair Pwllheli' ('Gwennie went to Pwllheli Fair'), the second item in the Dublin broadcast, is in the folk song collection made in Flintshire and the Vale of Clwyd by Lady Herbert Lewis (1872-1946), the wife of Sir John Herbert Lewis (1858-1933), M.P. for Flintshire early in the century. Herbert Lewis was also the Flintshire County Council's first Chairman, 1889-93. Lady Lewis herself was a Flintshire County Councillor, representing Caerwys in the 1930s. The accompaniment for this folk song was that of Morfydd Owen (1891-1918), the brilliant and promising Welsh composer who died young. She was the first wife of Ernest Jones (1879-1958), the eminent psycho-analyst and authority on Freud. Both Lady Lewis and Morfydd Owen were founder-members of the Welsh Folk Song Society. But for two youngsters it was the items 'Doli' and 'Rhywun' on the broadcast programme that caught the eye. They were to be sung by Dad, the Welsh tenor Jabez Trevor (1888-1972). He was just back from a second tour of North America. We saw little of him. But now Dad's voice would be coming 150 miles from across the Irish Seal The miracle of wireless! He would be singing these two items with words set to airs arranged by J. Lloyd Williams, the then Director of Music, University College, Bangor. They are in the 1909 volume 'Sixteen Welsh Melodies' (Boosey and Co.). still have this, my father's copy (price 3/-). The tune of 'Rhywun' was originally in a MS. Collection of Welsh Airs awarded second prize at the Llangollen Eisteddfod of 1858, and was said to be "very common in Glamorgan". The words of both 'Doli' and 'Rhywun' are by Alun (John Blackwell, 1797-1840), the lyric poet, born in Mold. His father, of English extraction, worked at the colliery at Pont Erwyl. At eleven, the son was apprenticed to a shoemaker in the town. But his poetic gifts led to local gentry and clergymen subscribing £200 to send him to Jesus College, Oxford. He graduated in 1828 and became curate of Holywell. The volume also prints English versions of Alun's words. They are by Alfred Perceval Graves (1846-1931), who was to publish later (1912) his 'Welsh Poetry, Old and New', an anthology of translations from the Welsh. His son was the English poet and novelist, Robert Graves (1895-1985), author of 'Goodbye to All That' (Penguin, 1929). This was near home. The Alun River was down at Pontblyddyn, only two miles away, where Dad had played for the Pontblyddyn Cricket Club, the oldest in north Wales. Before he became a professional singer in 1926, on a Saturday afternoon his collier's grime was transformed into cricketing whites for a match on a ground where the River Alun formed one boundary and a late-16th century farmhouse, Y Fferm, formed another. (Sixes were scored by hitting the ball into the river or into the farmyard). Yes, it was near home; and with Mam (the 'Someone') sitting there, contemplating the words 'My heart for Someone ...' ('Cadwaf galon bur i Rywun ... '), it was near home in more senses than one! Jabez Trevor was also singing the aria 'My Blodwen, My Love, My All'', possibly its first broadcast. Among Welsh singers, this aria has assumed the prominence that, say, 'Your Tiny Hand is Frozen' has among operatic arias in general. It comes, of course, from the opera 'Blodwen' by Joseph Parry, the Welsh composer who in childhood emigrated with his family to Danville, Pennsylvania. He was to return to Wales later to become Professor of Music at Aberystwyth. He was born in 1841, the seventh of a family of eight, in Merthyr Tydfil, at No.2, Chapel Row. Forty-seven years later, Jabez Trevor was born, also at No.2, Chapel Row, but in the coal-mining village of Leeswood, near Mold. He was the seventh of nine children. On that evening in June, he would be singing this aria, with the Welsh words of Mynyddog (Richard Davies, 1833-77), in which Sir Hywel, in the condemned cell, bids farewell to his beloved: '... the ribbon you gave me on the slope of the meadow ... tie it close to your heart'. We three would be listening to a box, called a loudspeaker, carefully placed on the dresser, with Dad's voice coming out of it. And Mam overjoyed! But what actually happened on that evening 'listening in' 60 years ago is related in my as yet unpublished book 'THE SONGBIRD IS SINGING,' subtitled 'Scenes from a Welsh Childhood in the 1920s'. What was a radio broadcasting studio like in the 1920s? "We just went into a room'" was about all I ever got out of my father. There was a box on a wooden stand, and "we just sang into it". I've heard that the 'box', the microphone, looked like an old-fashioned meat safe. Some HEL ACHAU readers of the older generation may recall that early broadcast if they were of the minority who had radio sets. Others may have memories of the Singing careers of the four singers who took part.